Range: Along the eastern North American coast from Nova Scotia to Yucatan and in the eastern Pacific Ocean. Habitat: Live in shallow waters ( around 11 to 36 feet deep) over sandy or muddy bottoms. Status: Only four out of five species of horseshoe crabs are still living today. The number of Horseshoe crabs is dropping because of pollution, loss of habitat, and over harvesting. Diet in the wild: Feed on worms, mollusks, and seaweed (algae) found in the sandy ocean bottom. Horseshoe crabs are not crabs, they are actually related to spiders. They are in the order Xiphosura of the class Meroostomata, in the phylum Arthropoda. The fossil records of the Horseshoe crabs have been traced all the way back to the Ordovician Period, around 500 million years ago. They are one of the last remaining members of a large group of animals that lived in the prehistoric times. As the larvae of the horseshoe crab hatch and emerge from beneath the sand under which they were buried, they closely resemble another extinct arthropod, the trilobite. For this reason, they are referred to as trilobite larvae. Over time, they begin to look like horseshoe crabs. Its body is divided into two segments. It has a large hoof shaped head and thorax, and a smaller hind body, or abdomen. It has a long sharp tail that protrudes up from the abdomen (used for digging). They are usually around 60 cm from the head to the end of the tail. On the top of its head, it has a pair of compound eyes and a pair of smaller simple eyes. In the center of the underside of the head it has a mouth. It has six pairs of legs, which end in spines. These spines are used to grasp and tear apart food. The abdomen contains six pairs of organs for swimming. The first pair is the openings of the egg ducts. The other five contain numerous flat gill books through which the Horseshoe crab breathes. 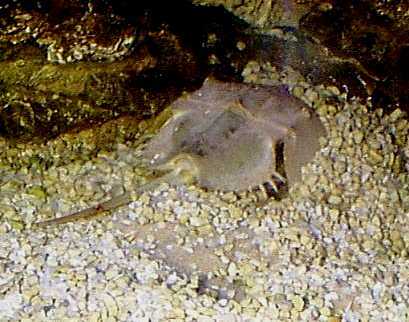 Although the Ft. Worth Zoo normaly houses Horseshoe crab specimens, there are currently none on display (as of 10-15-99). Hopefully more will be on display soon. At first sight, anyone can tell that the Horseshoe crab is an amazing creature. It’s incredible to think that they have been around for millions of years. The Horseshoe crab truly is a living relic to the earth which needs to be protected. America's Seashore Wonderlands. Tom Melham, H. Robert Morrison, Wheeler J. North, Cynthia Russ Ramsay, Suzzane Venino; 1985 National Geographic Society. The Fascinating World of the Sea. Elva D. Sheets; New York, Crown Publishers, Inc. 1974. Wild, Wild World of Animals: Aquatic Miniatures. Don Earnest; 1979 Time-Life Films, Inc.